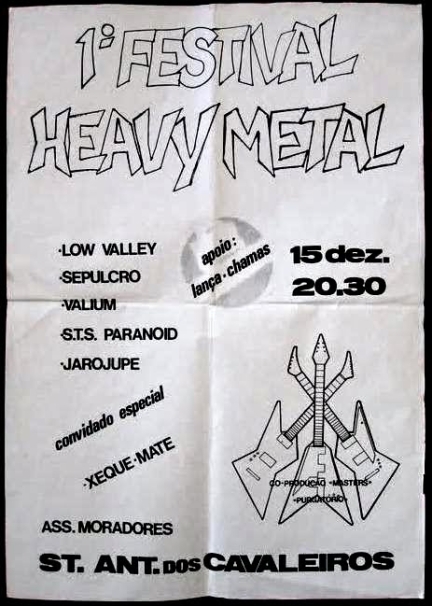 On December 15th of 1984, took place in Stº Antonio dos Cavaleiros (Loures) the first Portuguese Heavy Metal Festival, (would also be the only one) event that inspired countless bands and other underground agents. 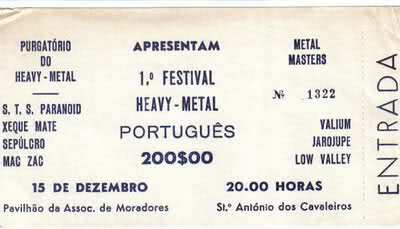 "The fan club Purgatório do Heavy Metal (Heavy Metal Purgatory) and the Metal Masters (group of friends who import from abroad records, recording them to tape and disclosed them through tape-trading) decided to organize a festival that brought together the best Heavy Metal bands", said José Gomes, former lead singer of Wild Shadow and Ravensire, founding member of the 1st Portuguese Heavy Metal fan club and fanzine (Purgatório do Heavy Metal/ Folha Metálica), also known by the pseudonym Zé "Mastercrow". The idea of holding the one who would become the 1st Heavy Metal Festival of Stº Antonio dos Cavaleiros it took shape and laid up to work. "We invited Valium, STS Paranoid, Xeque Mate, Sepulcro, Mac Zac, Jarojupe and Low Valley", continues Zé. At the time, the technical and financial resources scarce for organizing an event and the few that existed, appear to be especially rudimentary. Alongside this, the know-how was almost non-existent but the will and passion outweighed any difficulties. The adventures on the organization and the event began early, but there was always way to get on each stage of the process. "We got ourselves way of, in a print shop named Maiser (company of a friend), out of hours time, do the posters for free, and also made the tickets, the letters say HEAVY METAL and also arranged the backdrop", explains the publisher and musician, "We painted the walls and sidewalks in the vicinity pavilion of the Associação de Moradores de Santo António dos Cavaleiros (where it held the festival) with arrows and the words "the Heavy Metal festival is this way"", said Zé excitedly. The enthusiasm of Zé "Mastercrow" almost becomes palpable when narrating the sequence of hilarious events. "On the morning of the day of the festival it rained plenty. I was about to come to the pavilion when I came across the first difficulty: Xeque-Mates van had become mired in the mud 100 meters from the room. After 15 or 20 minutes of great effort, we and the bands, muddy up to the knees, we were able finally release the vehicle", explains. The PA system used on the event had been rented to the former elements of Grupo de Baile, who in 1981 had achieved huge commercial and radio success through the single "Patchouly". However, upon arrival to the interior of the pavilion, members of the Heavy Metal Purgatory fan club, Metal Masters and groups faced a new unexpected: the electrical system could not stand the power of the PA system. "We were inexperienced, we had never organized a show and not all fulfilled their duties. The verification of the power of the PA and the electrical system was not safeguarded", continues. The organization discover a EDP technician (electricity) resident in the area, to whom they paid, on his day off, to make a "pulled" from an electric pole, providing the necessary power to the event. At the time of the soundcheck, the public was already ine the in the room. Acoustic problems soon revealed. 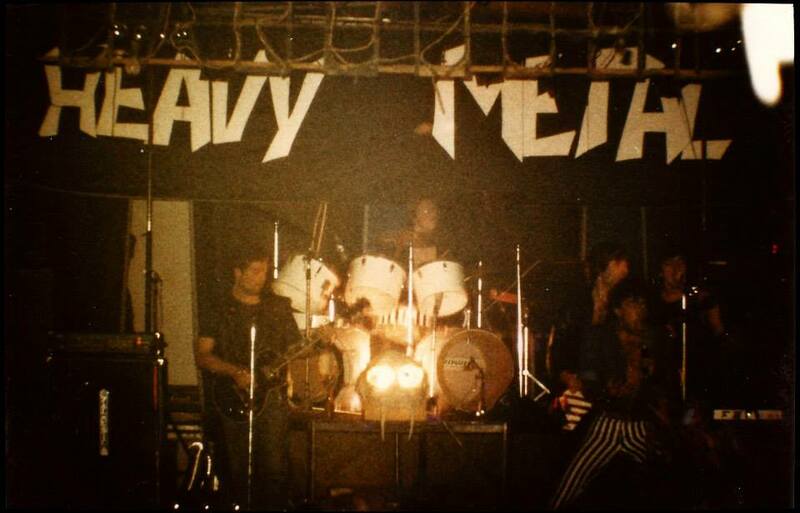 "The space was not suitable to receive such a sound power", emphasizes Rui Jorge (Metal Army/ Defensores da Fé/ Sagrada Escritura), known among the pseudonym Rudy Sagres. Other issues, however, hinder the smooth running of the sound tests and own concerts. "Northern groups: Mac Zac, Jarojupe and Xeque-Mate, were modest, shared the backline of Xeque-Mate. Humility does not feature, however, the southern groups, requiring use their own equipment. Once the soundcheck of a southern band was over, we retired their equipment to set up the following group. We lost a lot of time on it, with the public, impatient, already inside the pavilion", proceeds "Mastercrow". The situation could easily have become uncontrolled, as it was in the room close to five hundred people, of which only about 400 had paid the ticket. "We had trouble controlling the entrances and exits of staff during the dead time, although we have not given facilities", explains Zé. But the succession of setbacks was unstoppable. not having the organizers requested the necessary permits to hold the event, during the soundcheck a representative of the Portuguese Society of Authors (SPA) steps inside, fining the organization. Mac Zac were the first band to perform, followed by Sepulcro, Valium, STS Paranoid and Jarojupe. However, the popular saying goes that "bad luck never comes alone" and it seems very true, during the Jarojupe`s performance a spark from the pyrotechnics set fire to the canvas strip mounted on the stage. Local firefighters quickly extinguished the fire, but the fan club and Metal Masters would see the obligation to pay the intervention of peacekeepers. As a result, the performance of Jarojupe had to be interrupted and shortened. All these events, together with the high volume sound and the look sported by fans resulted in complaints from residents and the consequent invasion of the place by the GNR (polica force), about midnight time, when Jarojupe were still playing on stage. "They let us finish the show, but Xeque-Mate, "who were the headliners, could not act", regrets Zé "Mastercrow". In the end, the amount received was insufficient to cover expenses. From the organization, not all elements honor the financial commitments made to the bands. "We defined immediately start that there is no money to pay cachets, only travel, food and rental equipment, but much of it involved not paid", concludes Zé. Later, they pondered to hold a second edition of the festival, idea that would be abandoned. 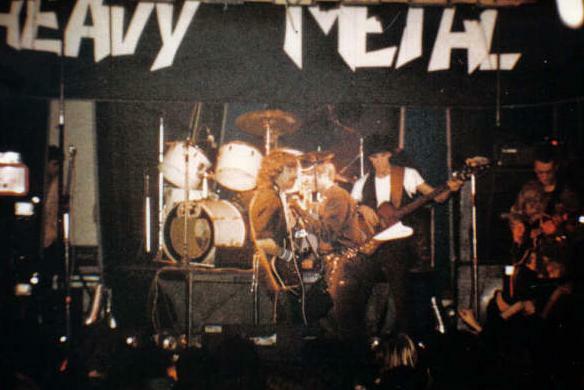 However, other similar events have taken place, highlighting in October 4th 1986 the festival "Metal Stage", held at the Cine Plaza in Amadora, with Cruise, Valium, Satan's Saints and STS Paranoid. Assisti! O meu primeiro concerto!! Nunca me irei esquecer!